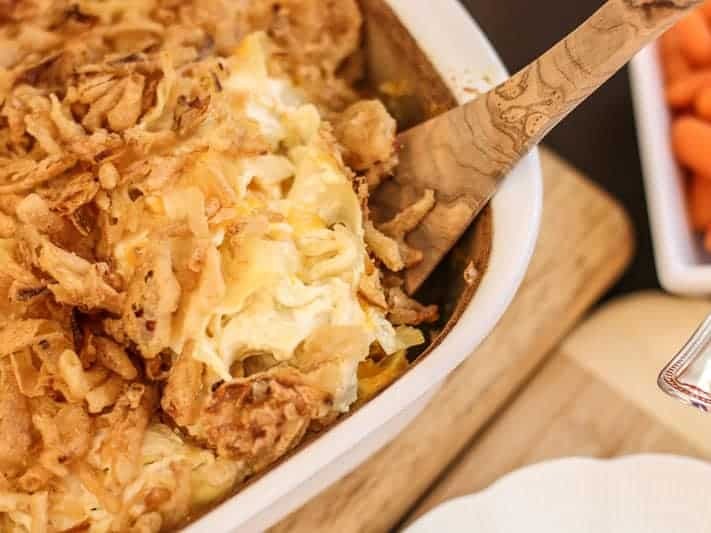 This French Onion Chicken Noodle Casserole recipe is a delicious Southern Food Classic. Sometimes you need a little food for the soul. Not the good for the body food; but the empty calories, finger licking, go back for seconds food. And this is one of those kind of dishes. Besides the protein from the chicken and cheese, there is not much else huge on nutrition value in this casserole. But boy is it good! 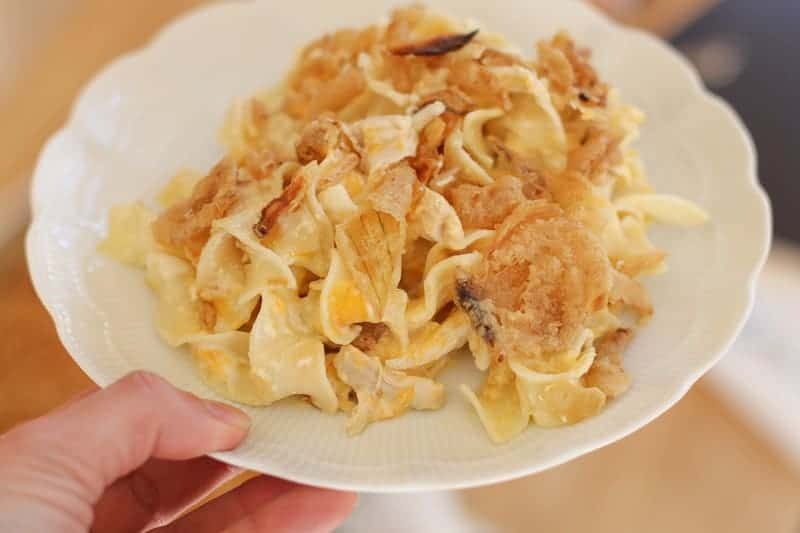 This French Onion Chicken Noodle Casserole is a recipe my whole family enjoys, and now your family can enjoy it too. My Mother and Father-in-Law love traditional southern food. We often get together for dinner, so when they come to my house, I try to cook the kind of cooking style they favor. 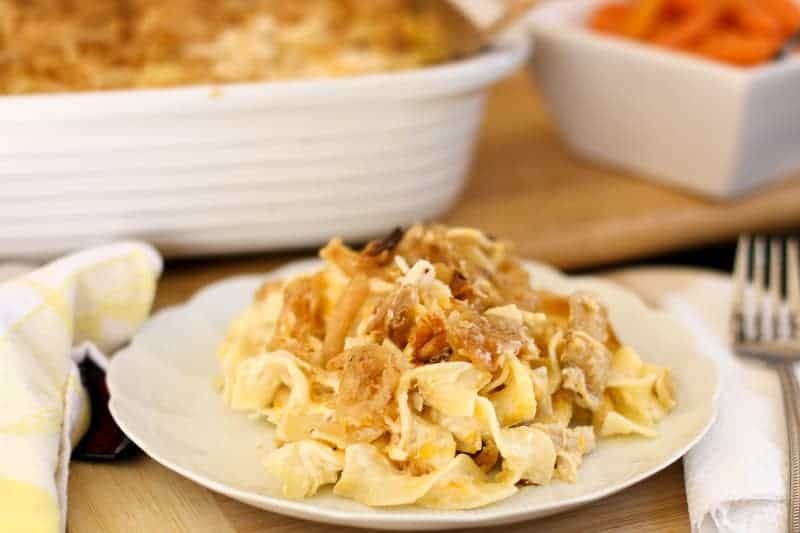 This French Onion Chicken Noodle Casserole is a southern classic dish. Best of all, the ingredients are fairly inexpensive and it is simple to make. 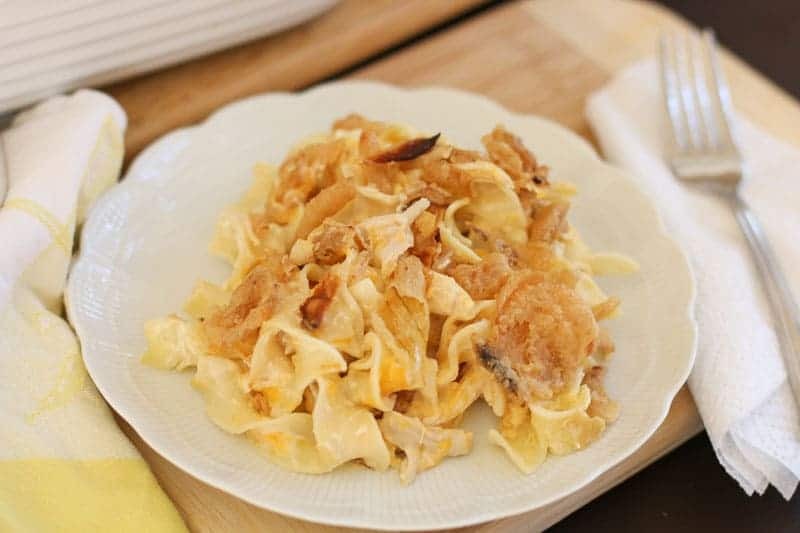 For this French onion chicken noodle casserole recipe, you can cook your own chicken or really make it easy like I did, and buy the precooked rotisserie chicken. Either way, make it tonight, and see what your family says. Be sure tell me later, because I know they will love it as much as my family does. And when they do, I told you so! If you like this recipe, check out Instant Pot Country Style Cube Steak, Grandma Kriz’s Hash Brown Casserole, and Southern Baked Beans Quintet. 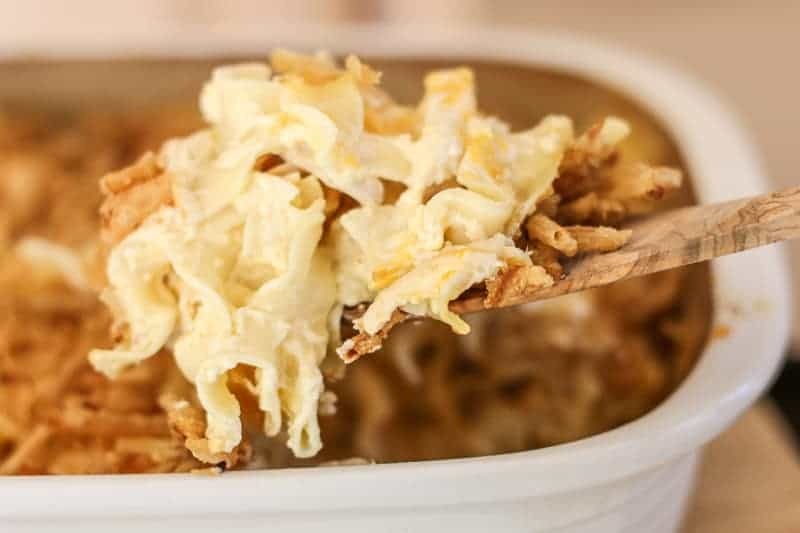 This French Onion Chicken Noodle Casserole is a finger licking, go back for seconds recipe that my whole family enjoys. Now your family can enjoy it too! Cook egg noodles. Drain and set aside. Preheat oven to 350 degrees. Grease 9x13 in baking dish. Mix chicken, soup, sour cream, and cheese together. Bake for 25 to 30 minutes until cheese is fully melted. I am so glad you enjoyed it!!! xoxo! Quit saying it LOOKS delicious…. it IS DELICIOUS!!! DIVINE!!!! My hubby who always wants things to taste like they came from Whole Foods went NUTS over this. Three helpings and he was still picking while we were doing the dishes. Thank you for posting the most wonderful late winter recipe. This will become part of our regular rotation. This old dog just learned a new trick! Total comfort food. My whole family would devour this dish. I love a good casserole! I have to try this one out! Looks yummy Katie! I will add this to my list! Thanks for sharing! This looks so good Katie!! I think you just answered my what`s for dinner question!! Drooling! That looks so good.. Perfect for this colder weather that seems to be creeping in on us! Comfort all the way around!